This bronze sculpture of The Gleaner of Sapri by G. Ricco was set on the rocks near Sapri in June, 1994. The Gleaner of Sapri was written in 1858. It is written in the first person, from the point of view of a woman working in the fields in Sapri, 120 miles south of Naples in the Gulf of Policastro. She sights the approach and landing of a ship bearing Carlo Pisacane and 300 men who set out from Genoa in the summer of 1857 to liberate the Bourbon Kingdom of Naples. The invasion was a disaster but was at least a precursor in spirit to Garibaldi's successful invasion three years later. Besides the poem, there are other reminders of the event. 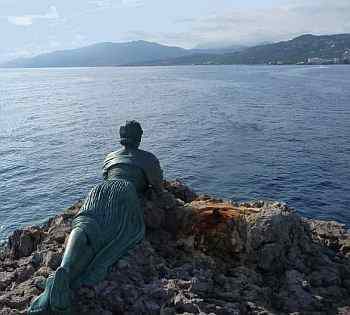 Many Italian cities have streets named for Carlo Pisacane, and the town of Sapri has a festival each year and has not only a statue of Pisacane but even a sculpture of the Gleaner, herself, perched on the rocks and looking out to sea (photo, above). In the poem, the narrator follows the landing of Pisacane's band at Sapri and their passage into the local hills where they are overwhelmed by a superior force. The verses of the short poem are broken up by the refrain, "Eran trecento, eran giovani e forti, e sono morti!" ["They were three hundred, they were young and strong, and they are dead!"] It is the most cited line from the poem and has become proverbial —that is, if you say "Eran trecento...", any Italian will be able to finish the line for you. And hoisted for its flag the tricolor. Landed with arms, but not as foemen land..."
Pisacane, himself, was born in Naples in 1818. He attended the Nunziatella military academy and then served in an engineer battalion building railways in the kingdom of Naples. He was a totally political thinker and, depending on the source, is described as a liberal, socialist or even the first Italian anarchist. He was, like many of his generation, obsessed not just with unifying Italy but with the principles that would sustain the nation —liberal, classless, anti-authoritarian with freedom and justice for all. Amen. He was involved with the social and political unrest in Italy in 1848 and with setting up and defending the brief life of the Roman Republic in 1849. As a result of such activity, Pisacane was forced to flee into exile on various occasions to England, Switzerland and France. In 1853 an uprising against Austrian rule in Milan failed; Giuseppe Mazzini, the philosopher of the Risorgimento, then proposed an expedition to stir up a revolt in the kingdom of Naples to overthrow the Bourbon monarchy and help bring about a united Italy. It took a few years for the idea to ripen, but in 1857 Pisacane volunteered to lead the expedition. That was probably not a good choice. Unlike Garibaldi, Pisacane was not born to lead men into battle. He was born to think and write about politics; indeed, he wrote extensively about the Italian wars of 1848 and 1849 as well as about the ideal forms of just government for a new Italy. He was an intellectual in the role of a soldier and not prepared for that role. At least warrior Garibaldi, three years later, sailed out of Genoa with 1,000 men, many of them veterans of earlier campaigns; they were ready to fight and win battles, pretty much of a prerequisite if you are going to win a war. Temperamentally, Pisacane was more like his predecessor in Neapolitan revolutions, Eleonora Fonseca Pimentel, another intellectual who thought if you explained the justice of your cause to the people, they would rally to you. Pisacane and 22 like-minded revolutionaries set out as paying passengers (!) from Genoa on the steamer, Cagliari, on June 25, 1857. Once at sea, they hijacked the ship and Pisacane explained his mission to the passengers and crew and invited volunteers to join him. It is not clear if there were any takers. Off the island of Ponza, 50 miles NW of the Bay of Naples, the ship feigned distress and was allowed to land. Ponza was the site of a Bourbon prison that held a number of political prisoners. Pisacane and his men took over the prison, emptied the armory and liberated and enlisted over 300 prisoners, about one-third of whom had had military experience. They landed at Sapri where Pisacane had anticipated that his arrival would spark spontaneous anti-Bourbon uprisings throughout the kingdom. They were met in Sapri, however, by apathy and suspicion. Pisacane's plan was to head through the Cilento hills towards Padula and turn north and into the Campanian plain to Naples, by which time he apparently thought his ranks would have swollen to an irresistible force. At Padula, they were forced to retreat back to the town of Sanza where Pisacane was killed, most likely by locals convinced by authorities that Pisacane and his men were marauding bandits. (Some sources say that Pisacane, in the face of certain defeat, turned his pistol on himself.) His men then met the main body of about 1200 Bourbon militia and were defeated. The landing at Sapri had sparked no outbreaks of sympathy from the populace much less been a signal to pockets of organized anti-Bourbon resistance that Pisacane had been expecting. 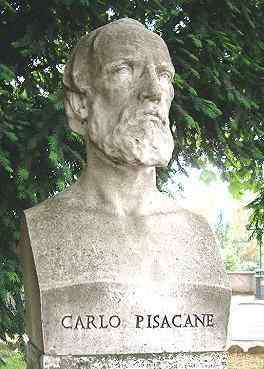 Pisacane never stood trial, but one of his group was Giovanni Nicotera, sentenced to death (commuted by king Ferdinand to life in prison). When Nicotera was offered the chance to voice his gratitude in the tribunal by proclaiming, "Long live the king!" he said, "We don't fear prison or death...shouting 'Long live the king!' is like shouting 'Death to Liberty!' "
Victory, when it is in accord with progress, merits the applause of the people; but a heroic defeat merits their tender compassion. The one is magnificent, the other sublime... John Brown is greater than Washington, and Pisacane is greater than Garibaldi. by Richard Mann Roberts. Pub. Matador. Leicester UK, 2010.